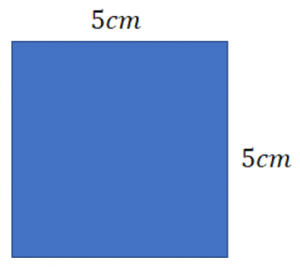 A square has side lengths of 5cm. How do we find the area of a square? We multiply the sides together! And this is exactly how we make squares numbers; we multiply a number by itself! Because we should know our times tables up to 12×12, we should be able to learn our squared numbers up to 12×12. Cubed numbers are only a little trickier, we just multiply a number by itself twice. Question 1: What is 7^2? Question 2: What is 4^3?